Island Bird Cat & Dog Veterinary Group, in Staten Island, New York, is the practice of veterinarian Dr. Frank Scandaglia. Our professional veterinary services include wellness exams, immunizations, medical, surgical, and dental care for dogs, cats, birds, and other pets. We specialize in avian and exotic pet care. We are committed to animal owner education and we hope you will explore our website to learn more about animal health and our clinic. Please contact us with any questions. A veterinarian is a physician who has been educated and trained to diagnose and treat diseases and injuries in animals. 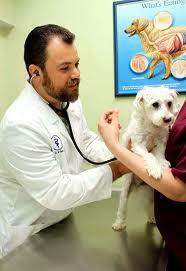 Most veterinarians care for companion animals (e.g., dogs, cats, birds, ferrets, rabbits). They may specialize in care for horses (both pleasure and performance), production animals (e.g., dairy and beef cattle, sheep, pigs, poultry), aquatic, and zoo animals. Veterinarians vaccinate, attend births, administer medication, perform surgeries, and provide general health care. Veterinarians may perform biomedical research (i.e., genomics, cellular mechanisms, cancer biology) and/or serve as faculty at colleges or universities. They also play a role in public health, preventing the spread of animal diseases to humans, ensuring the safety of the food supply, and performing livestock health inspections. Experience working with animals prior to applying to a veterinary program is desirable. Completion of undergraduate prerequisite courses. Requirements vary, but on average, 2-3 years of undergraduate study is required for admission. Most veterinary students have a baccalaureate degree and some earn advanced degrees prior to enrolling in a veterinary program. Completion of a 4-year program leading to a doctor of veterinary medicine (DVM or VMD) degree. There are 27 accredited veterinary colleges or universities in the United States. The veterinary curriculum focuses on biomedical science, including anatomy, physiology, bacteriology, virology, medicine, and surgery. Programs also include coursework in topics such as professional development, practice management, and client relations. Most programs are divided into a preclinical and a clinical phase. The first phase is primarily concerned with classroom study and laboratory work. The second, clinical, phase allows students to learn medical and surgical principles through hands-on experience. Students are trained to treat many animal species and later may focus on certain groups, such as companion animals, production animals, and horses. Following graduation, veterinarians must pass the North American Veterinary Licensing Examination (NAVLE). State licensing boards set eligibility requirements; candidates must apply for NAVLE certification through their state boards. Graduates may continue clinical training through an internship or residency and must obtain state board approval before opening a clinical practice. An extended period of formal study is required for board certification in a specialty, such as surgery, ophthalmology, pathology, radiology, and medicine. Medical subspecialties include cardiology, oncology, and neurology. In addition to accreditation by the NAVLE, veterinarians interested in working with federal and state animal health officials may also seek accreditation by the U.S. Department of Agriculture, Animal and Plant Health Inspection Service (APHIS), Veterinary Services (VS). The National Veterinary Accreditation Program (NVAP) is administered by APHIS. Although the program is voluntary, more than 80% of veterinarians in the United States are accredited by NVAP. Veterinary technicians perform duties comparable to those performed by a physician assistant for a physician. At least 2 years of college education is required, and some programs award a bachelor's degree. The American Veterinary Medical Association (AVMA) has accredited more than 75 veterinary technician training programs. Most states have certification or licensing regulations for this field and many require the Veterinary Technician National Examination. Under the supervision of a veterinarian, veterinary technicians work in private practice, zoos, laboratories, and research settings.